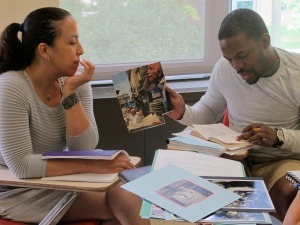 The NYCWP Invitational Summer Institute offers teachers a leadership experience in the teaching of writing and reading. Participants explore ways to improve the teaching of writing in the classroom, and prepare to disseminate strategies and methods to larger audiences of teachers. This institute brings together ELA and content-area teachers from elementary, middle, and high school classrooms across the city. The ISI balances theoretical, practical, and experiential components and encourage adaptation of sound literacy education practices and applications. Teachers leave Invitational Summer Institute with new lessons and resources, and with draft action plans that inform their curriculum and instruction in the coming year. Participants also create portfolios of learning that include the aforementioned action plans and lessons, at least two pieces of creative writing, and other materials. 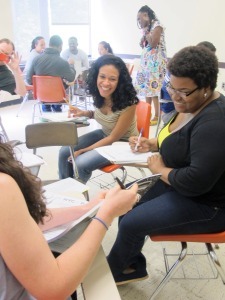 The Invitational Summer Institute is a competitive program. Applications are made available in the mid-winter, with interviews taking place in the early spring. Fellows are compensated for their time with either a monetary stipend or tuition-waived graduate credits in English from Lehman College. For more information about the ISI, contact admin@nycwritingproject.org. ← previous NYCWP Voices - Call for Submissions! next → Save the Date for #T2T16!